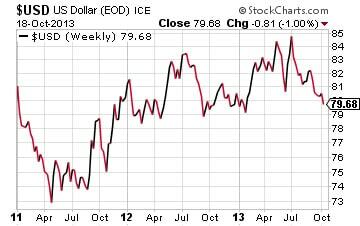 Is the Dollar Breaking Down? Gold and silver spot markets enter the new week looking a bit healthier following last Thursday's price rally. The short-term deal reached in Congress to increase the debt ceiling and re-open the government prompted traders to buy metals. Gold gained nearly 4% last week and silver rose almost 3%. But Where Is the Inflation? Money Metals Exchange specialists get lots of questions from our customers about metals prices underperforming over the past 24 months despite copious amounts of money creation. Gold and silver prices are well below the levels prior to the announcement of the current Quantitative Easing program, which features more than a trillion dollars per year of freshly minted cash (or an electronic representation of such, at least). Nearly everyone predicted a weaker dollar and higher metals prices when the program was launched. Nearly everyone has been wrong -- at least in the intermediate term. However, the dollar now shows signs of breaking down on the charts and resuming its long-term bear market. The U.S. Dollar Index broke below the 80 level last week, recording an 8-month low. The USD may find some temporary support in the 78-79 area. If that support zone gets taken out, a plunge down to the 2011 low of 73 could be in the offing in the months ahead. Although the USD's pullback over the past few weeks hasn't provided much lift for precious metals, a major move lower in the dollar will put some significant upside pressure on metals prices as quoted in dollars. There is plenty of good evidence to support theories of market manipulation and large commercial banks rigging moves lower in order to profit on concentrated short positions. But, setting aside manipulation arguments, there is another key metric metals investors should understand. The mechanism by which the Fed pushes the cash they print into the broader economy appears to be broken. Banks aren't lending. Banks are sitting on cash instead. Excess reserves -- balances above minimum bank reserve requirements -- are currently estimated at $2.3 trillion. This excess has grown by nearly a trillion dollars from levels prior to the 2008 financial crisis. It is money locked up on deposit with the Federal Reserve instead of being unleashed into the general economy to bid up prices. Clearly the QE programs have generated wondrous results with regard to bank balance sheets. Metals investors may be frustrated, but it is important to recognize the price inflation they expected is merely delayed. Banks are unlikely to sit on these excess reserves forever. Many of the key economic reports delayed by the temporary government shutdown will be released in coming days. Monday, Oct. 21st – Existing Home Sales. The housing market has shown signs of slowing. Mortgage applications have fallen substantially and inventories of unsold homes have grown. Tuesday, Oct. 22nd – Employment Situation. The Bureau of Labor Statistics' main report on jobs was originally scheduled for Oct. 4th. The consensus is for weaker data, which would diminish the already low probability for the Fed to announce tapering at the upcoming FOMC meeting. Friday, Oct. 25th – Durable Goods. Most analysts are expecting the report on durable goods orders to show anemic growth. Order Online or Call Money Metals Exchange at 1-800-800-1865 for Precious Metals Coins, Bars, and Rounds.